"Rather than spurning financial system terrorists, Holmgren urges activists to become “terra-ists”; to directly bring down the system by thousands of acts of economic disobedience." 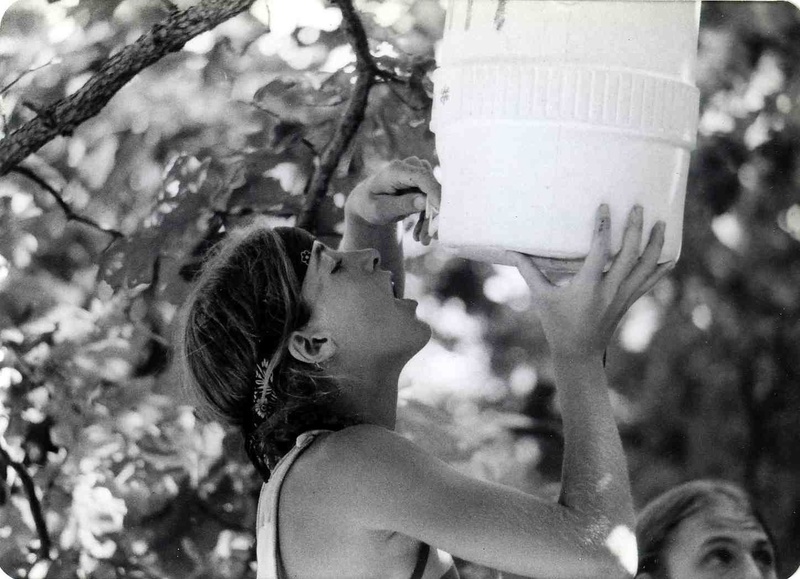 A ferment in the environmental movement, brewing for many years, has now bubbled up into the blogosphere. We are dipping our ladle in here to take a little taste of it, even though we are quite certain it is not done fermenting. Bill McKibben has been stirring the wort of whether social activism can save us for many years. In Eaarth: Making Life on a Tough New Planet, as in The End of Nature a quarter century earlier, he poignantly waffled, in elegant prose, between hope and despair. Since launching 350.org — “the first political action with a number for a name” — he has urged those of us with any remaining shred of hope for our children’s future, given what we now know about climate change, to step up and lay our lives on the line. Get arrested. Risk lengthy jail terms and even death to stop this atrocity. Do not go gentle into that good night. Words to this effect we have heard much longer and louder from Derrick Jensen, another eloquent writer, the difference being that McKibben advocates for non-violence in the mold of Gandhi and King, while Jensen has no qualms about advocating violence. Naomi Klein, another stirring writer with an arrest record, calls for acts of resistance large and small. McKibben is tepid about taking on capitalism’s growth imperative, as though it were not a major contributing factor, while neither Holmgren, Klein nor Jensen have any such reservations. Thus we are tasting many different flavors of leadership, or literary guidance, in the shaping of the nascent climate resistance movement. Scientists themselves have been growing politically more active and radicalized, as Klein described in her October New Statesman essay. 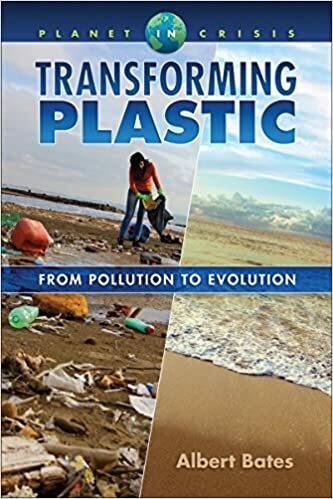 If you go back enough years you’ll find scientists like Dennis Meadows, Howard Odum and James Lovelock, all of whom correctly foresaw the impending collision between consumer civilizations and natural systems. Lovelock made a series of climate-and-society predictions that went unheeded for 20 years but hold up well in retrospect. Joining the chorus of climate Cassandras with more structured harmonies are the peak-oilers and financial collapsarians. These thoughtful writers straddle a continuum that is both time-sensitive (near-term, middle term, long-term) and outcome ambivalent — they are undecided as to whether the future they foresee will be a good thing, a bad thing, or even survivable. Guy McPherson has staked out the lonely position for near-term human extinction, which might be a good thing or a bad thing, depending on how you look at it. Richard Heinberg, Nicole Foss and Steve Keen all see financial constraints as the leading edge of whatever storm is forming, and are not making predictions about how or when, but are planting gardens and putting up canned goods nonetheless. Michael Ruppert, James Howard Kunstler and Dmitry Orlov are also decoupling from whatever economic grids they may be attached to, but do not foresee a particularly happy outcome in all this. Social unraveling is not a pretty picture, as Orlov describes in his Five Stages of Collapse. What suddenly bubbled up from the blog vat at the start of 2014 was a white paper authored by David Holmgren, one of the founders of permaculture, reversing a position he had long espoused. Instead of associating himself with peaceful change by calling for restraint on overconsumption and gradual adoption of the degrowth economic paradigm, extending it ever outward until it became the mainstream culture, Holmgren abruptly called for “Crash on Demand” or a strategic decoupling by masses of youth (and elders) from the economic system that is the crashing the planet’s ecological stasis, by simply walking away. “Rather than spurning financial system terrorists [a.k.a. banksters or the 1/10th-percent],” Holmgren urged activists to become “terra-ists”; to directly bring down the system by thousands of acts of economic disobedience. “The urgency for more radical action to build parallel systems and disconnect from the increasingly centralized destructive mainstream is a logical and ethical necessity whether or not it contributes to a financial collapse,” he wrote provocatively. “Decentralization initiatives already face opposition, but this could become significantly worse if perceived to be even more of a direct threat to the establishment,” Foss concluded. Having these positions staked out was useful for the discussion of strategy that change agents need to be more engaged with. Klein and McKibben seem to think that if we just have enough “Battles for Seattle,” the economic system of global civilization will be radically restructured. Our own experience in joining dozens of massive marches and actions of civil disobedience but nonetheless failing to end the Vietnam War has perhaps jaundiced our views in this regard. Moreover, Holmgren and Foss make clear that that’s not going to happen. Even the recently unveiled strategy of fossil fuel divestment, as promising as it is, and as grounded in investment reality of the stranded, overvalued assets unable to ever be burnt, stands little chance of being able to arrest climate tipping points that may have been triggered decades ago. 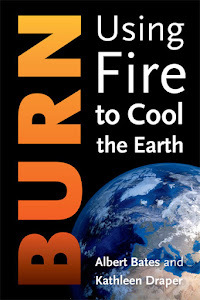 Our own view is that the likelihood that a runaway greenhouse effect is now underway is greater than it has ever been, and to call what is coming a bottleneck is a poor choice of words except perhaps in the sense of the genetic bottleneck experienced 70-80 thousand years ago in connection with a supervolcano that reduced our hereditary lines to fewer than 5000 individuals worldwide. While we understand the concern she raises about unduly politicizing the issue, we’d say that cat has left its bag and keeping silent for fear of numbing the population makes no more sense for climate change than it does for Ponzi economics. Indeed, the parallels between the overdraft on Earth’s atmosphere and the excess claims on fictional central bank assets are striking — neither is going to go away simply by ignoring them. In both cases, the cake already baked. 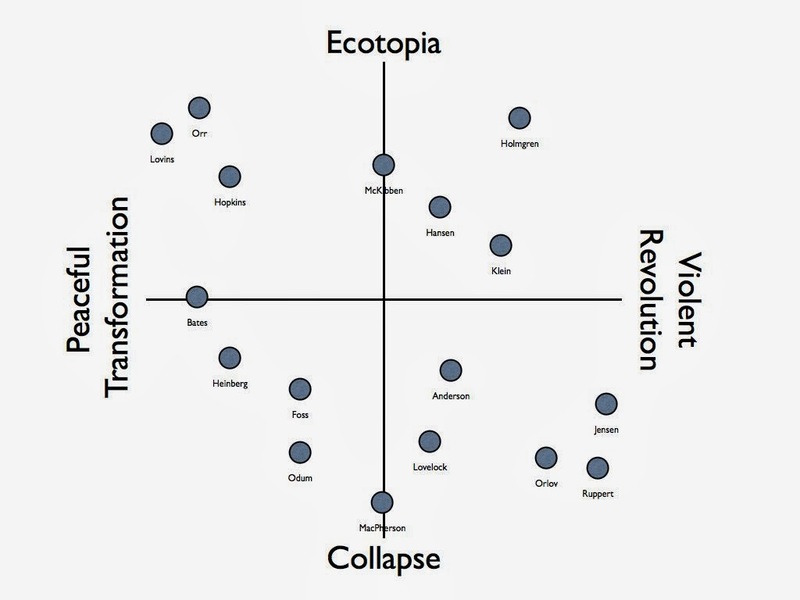 This prompts us to make a new grid to categorize the range of opinions amongst peakists, collapseniks, politicos and anarchists. It goes something like this, at first drawing, and we welcome corrections, especially from those named. 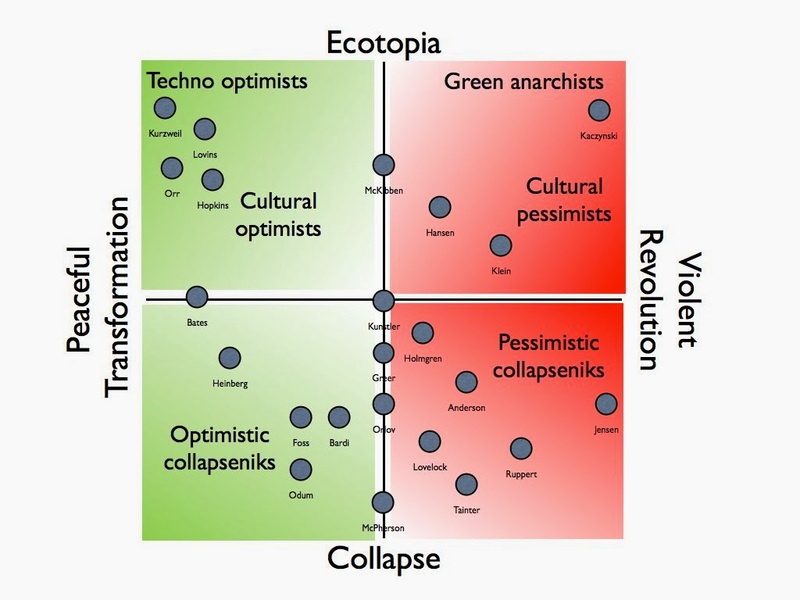 Our own position in this matrix, outlined in two books since 2006, is off to the left and centered on the line, meaning that while we are adamant in our advocacy for peaceful transformation, we are doubtful as to whether ecotopia is possible without collapse. Those seem to us to be a coupled pair. Likewise, McKibben is in favor of a new green economy but stuck vacillating between more peaceful and less peaceful means of getting there, while McPherson is deeply wedded to inevitable collapse without caring any more about social responses. Not surprising, given what they know, scientists like Lovelock, Ken Anderson, and Howard Odum all fall below the line dividing Ecotopia from Collapse. Odum, we suspect, would have been in favor of peaceful transformation, while the others would like us to push harder and force the issue. Naturally those most concerned with Holmgren’s shift would be those closest to his former position, including Rob Hopkins. Those closest to him now — Kunstler, Anderson, Hansen and Klein — would be the most likely to approve. What is missing from Holmgren’s paper are the advances in terrestrial carbon sequestration — as opposed to Ponzi geoengineering — in no small measure reaching fruition by dint of permaculture design. While permaculturists like Rob Hopkins, Declan Kennedy and Max Lindegger pursued innovations in social structures — transition towns, complimentary currencies and ecovillages — other permaculturists — Darren Doherty, Richard Perkins, Joel Salatin and Ethan Roland, to name just some — have pushed the envelope to see how much carbon can actually be returned to the soil. This revolution is the subject of Courtney White’s new book, Grass, Soil, Hope: A Journey Through Carbon Country, scheduled for release in June. Would we have ever learned that a mere 2% increase in the carbon content of the planet’s soils could offset 100% of all greenhouse gas emissions going into the atmosphere if we had not been so frightened of climate change by Al Gore and other scaremongers? Speaking as one who wandered deep into Amazonian history to discover this new paradigm, we reply: probably not. Now lets step back and add a whole ‘nother layer to this. There is a really good cultural transformation going on, with ecovillagers, ecological restorationists, soil remineralizers and post-empire econometricists. Simultaneously, there is a really negative übertrend of banksters and purchased or annointed politicians enriching themselves off oil, nuke and the wealth of nature, then turning all that surplus into the worst kinds of pollution – the kinds that take millennia to degrade and even then impair gene pools for untold generations. These two conflicting transformations coexist against the backdrop of almost immeasurably immense climatic and biosystemic change that will severely affect, if not drive, our world in the future. We all exist in the context of ecosystems and yet these familiar norms are being utterly destroyed while we write this. The tiny little good ecovillagers, permaculturists and transition towners do pales in comparison to the scale of damage of unrestrained growthaholism that seems almost a genetic imperative of our species — and we are the keystone species in ecosystem Earth. Holmgren has this right, and it is undeniably frightening. We’re sure there may be more thoughtful readers who can add to this analysis and produce more insights than we have, but as we say, we’re just grateful to be having this kind of discussion. The conversation continues in our next post, Recharting Collapseniks. After co-teaching a permaculture course in Belize with Nicole Foss next month, we will be vetting this analysis with Dmitry Orlov, Dennis Meadows, John Michael Greer, Gail Tverberg, KMO and others at the Age of Limits conference in Pennsylvania in May. thanks for this nice analysis! My question is if/where would you put Dave Cohen (retired peak-oiler and now retired blogger), who wrote around +1500 blogs on our collctive predicament during the last 3 years of the Decline of The Empire. It's not that I'm not concerned about climate or that I'm denying in any way that climate chaos is occurring. I do think there's more uncertainty in the science than most people seem to, but uncertainty and complexity intrigue me. I am fully supportive of biochar and other small to medium scale carbon sequestration methods. They're a complete win-win. I would add industrial scale sequestration efforts to my list of things likely to be counter-productive, as anything on an industrial scale is going to be carbon intensive, and could well make things worse. I'm not suggesting shutting down conversations on the science or any such thing. It's mass awareness and fear that I think are likely to be counter-productive , especially if they lead to large scale 'policy responses'. I have zero faith in the ability of the political system to address any systemic threat in a constructive way. I look forward to reading the presentations at the Limits to Growth conference in W Virginia. I don't fly these days. And as Alex asks - where is Ugo Bardi (the Chemistry Prof)? This is an awesome analysis. Great work! I'm still grasping at the possibility of influencing some people, so I gravitate to the positions of Bill McKibben, Rob Hopkins, and others, including Heinberg and yourself. As far as which narratives can be either helpful or accurate, only time will tell. Thank you. This is valuable and will be increasingly useful if/as the mentioned folks respond and clarify. I sit in the midst of Holmgren, Bates and Heinberg. To trigger the crash and reset to a lower level of GGE, Holmgren's piece calls for pulling pins out of the global financial system through household and local initiatives aimed to cut consumption, relocalize economies and build community resilience. This, he says, is to be undertaken by a committed minority of people in affluent countries. Some readers may be appalled at Holmgren's suggestion that it might be appropriate to intentionally crash the system. But this assumes that we could "crash the system," if we so chose. Many committed individuals and organizations (small and large) have been working at all levels (grassroots, corporate, government, NGO, urban, rural, "inside" and "outside" "the system," etc.) for decades now in effort to "cut consumption, relocalize economies and build community resilience." These laudable efforts have yet to arrest or even slow the global economy, let alone crash it. Such have been the stated objectives of various "green groups" for so long now; so why hasn't it already happened? The global economic status quo has enormous inertia, and Holmgren alludes to our widespread paralysis in the face of this. 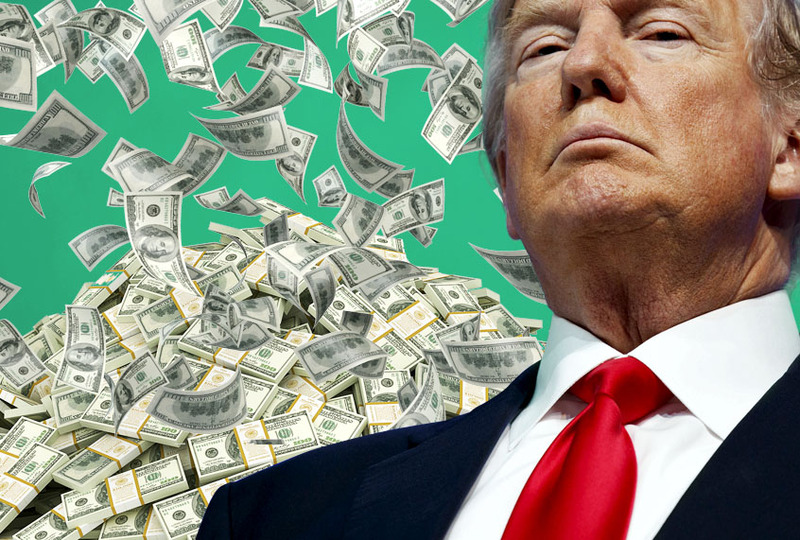 Additionally, vast sums of money and tremendous political forces are arrayed to propping up the status quo at all costs. This suggests that even if a "committed minority of people in affluent countries" came to agreement that it is necessary to "crash the system," they would not be able to do so. I question whether Holmgren is suggesting that green groups do anything they have not already been doing for years now, albeit perhaps with the altered explicit intention of "crashing the system." Even that does not seem new, as many green activists find the system abhorrent and have been explicitly trying to sink it all along. Is the realization that "We can't crash the system even if we wanted to" less palatable, even, than what Holmgren proposes? Western (white) middle-class children are taught from a young age, "You can grow up to be whatever you want - you can change the world!" I find that this attitude has been carried forward into a lot of (white) middle-class environmental and social justice movements. An overdeveloped sense of personal empowerment has apparently led many to believe that they have a responsibility to "make the world a better place" - what is implied is that they have the power to do so. This becomes too teleological (not to mention hubristic and Messianic): we become green activists because "We Must Win!" Holmgren makes the allusion to a "not-so-slow moving train crash." This is an apt analogy because once the train crash has begun, there's nothing anyone can do about it. Likewise, we do not have the power or control to "crash" the global financial system in the manner we choose and according to our preferred timeline. What happens is what happens, over whatever time period it turns out. Our job is still to "cut consumption, relocalize economies and build community resilience." But we are better off doing so non-teleologically. We do it because it's the right thing to do, and the best thing to do under the circumstances, not because "We Must Win!" While I heartily agree it does no good to over-estimate your ability to alter the course of history, I have to say every now and then I feel that humongous boulder budge a little, and damn but doesn't that feel good! I don't know how anyone could come away from a careful reading of IPCC-5 or any of the newer papers published in Science, Nature, or the specific journals for the climate field and still say "I do think there's more uncertainty in the science than most people seem to." I just have to shake my head at that, as I do for the "best thing is to say nothing" remark. This article provides a very helpful framework for discussion. I have a contribution to make to the discussion about stakeholder engagement/collaborative problem solving processes designed to maximize citizen participation in local efforts to overcome the challenges of our times. This writer has contributed (in many places) a “List of Ten Critical Challenges” (1 page)(condensed from compilation of excerpts assessments over many years)(accessible at http://cpcsc.info/tipping-point-action/ ). He feels that almost all of the challenges in the list—especially halting global warming before unprecedented negative feedback loops set in—will involve whole cultures needing to find contentment and quality of life using much less materials goods and ecological services. One important point on that list which is absent from many other critical challenge assessments he has seen is #7 “A Marginalization of the Treasured Wisdom of Religious, Spiritual, and Moral Traditions” (with a not unrelated, and more widely cited, challenge being #2 “Cultures of Violence, Greed, Corruption, and Overindulgence”). While there are many people who are cynical about the value of such treasured wisdom, those who have experienced such wisdom know that “The satisfaction of one's physical needs must come at a certain point to a dead stop before it degenerates into physical decadence.” (Mahatma Gandhi). Most people would agree that there are many people who do not understand that kind of wisdom now—but how many people would also agree that “their help will be needed” to avoid disastrous global warming outcomes? Thus, if one is cynical about whether many people can—or are willing to—deliberately cultivate the above traditions for the treasured wisdom, they may also disregard the potential for collaborative problem solving which would attempt to engage “people who do not understand that kind of wisdom”, (as irrelevant, since they dismiss the idea that “their help” will ever be forthcoming). My main point here would not be that all we need are more collective kumbaya experiences (as in why can’t we all just get along? )—but that there are gritty, nuts and bolts grind it out do your homework and build trust in stakeholder engagement/collaborative problem solving processes which can be adopted into use in many different kinds of communities and cultures. And if one does believe—for whatever reason—that even with the unprecedented challenges ahead, we can arrive at a positive outcome, then it is common sense practical, and has much to commend itself in the long run, to 1) deliberately cultivate the religious, spiritual, and moral traditions for the treasured wisdom, and 2) increase our efforts in research, advocacy, and best practices sharing of stakeholder engagement/collaborative problem solving models which are designed to maximize citizen participation. There are many ways to build momentum for such collaborative problem solving processes. In December, 2013, this writer [as the primary organizational person for the Community Peacebuilding and Cultural Sustainability (CPCS) Initiative] launched a campaign called “Tipping Point Action: Citizen Participation in Times of Unprecedented Challenges”. The three primary outreach documents for that campaign—and much information about how volunteers can contribute—can be accessed at the “Outreach for the Tipping Point Action Campaign” webpage, at the website for the Community Peacebuilding and Cultural Sustainability (CPCS) Initiative. 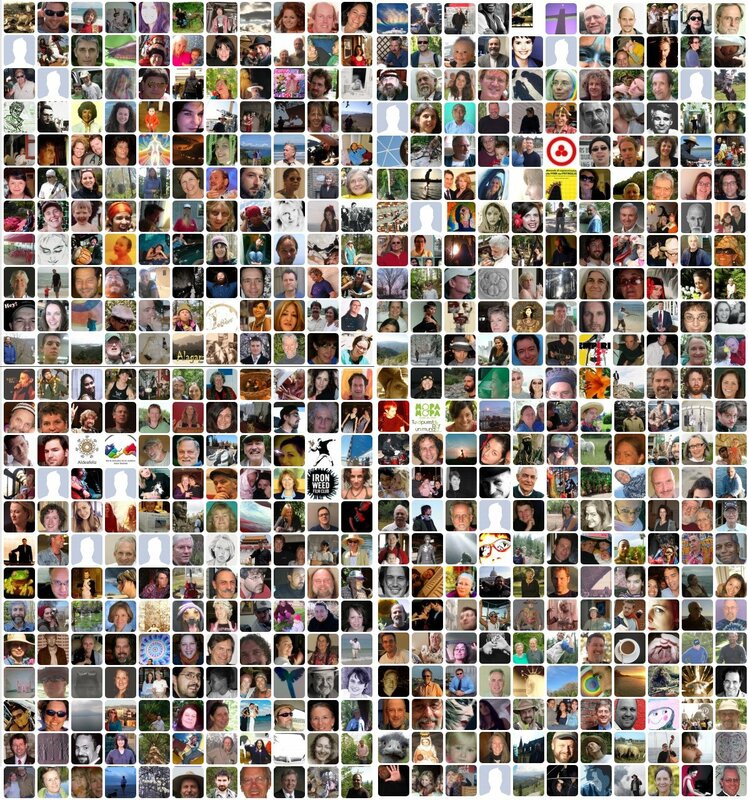 The more people know about organizations, initiatives, and campaigns which have their eyes wide open about the challenges, but are nevertheless doing the gritty, nuts and bolts grind it out do your homework and build trust in thinking and doing which will help matters—the more likely they will be to choose those options to participate in. Albert - I have great respect for you (even though you are a permacultist!) because of your focus on real work with the soil. You are the only person, besides myself, that I have ever heard say, "We can make soil. We don't have to rely on the 1000-year per inch process." I also appreciate that you have read widely in anthropology and genetics (e.g. mentioning Jorde and Harpending). However, I think your argument is as simplistic as Holmgren and Hopkins. Putting analysts on a neat little chart with four sectors lacks nuance. We just don't know what is going to happen do we? Keep feeding people and building alternatives for the future. That's real change. I agree that the map is not the territory, and this is especially true of mind maps. I am just an impulsive doodler. By the way, I think the best place for me on your graph would be to place me roughly at the intersection of a horizontal line drawn through Odum and a vertical line drawn through Bardi. I try my best to encourage peaceful transformation, but that doesn't mean I think it all that likely when supply chains are so vulnerable and financial crisis can be very abrupt. Basically, I'm trying to push from where I indicated on your graph towards where you initially put me. The odds of success I rate as low, but the effort is absolutely worth it. Also I think it would be good to put David Korowicz on the graph. He's a very serious thinker on these issues. I'll ask him to suggest where he thinks he would fit. Accepting still more feedback, I have readjusted Nicole Foss's position to her specification, repaired Guy McPherson's spelling, and added Ray Kurzweil to the upper left quadrant, staking out a polar opposite position from Ted Kaczynski. James H. Kunstler suggests a good sort criteria might be whether the individual expects a mere demise of society or of the entire human prospect. I concur, but don't know that many, other than Guy McPherson and James Lovelock, are willing to reveal that. Thanks Albert. This is somewhat along the lines of a chart I posted last year reviewing David Graeber's book, which is a bit more complex. 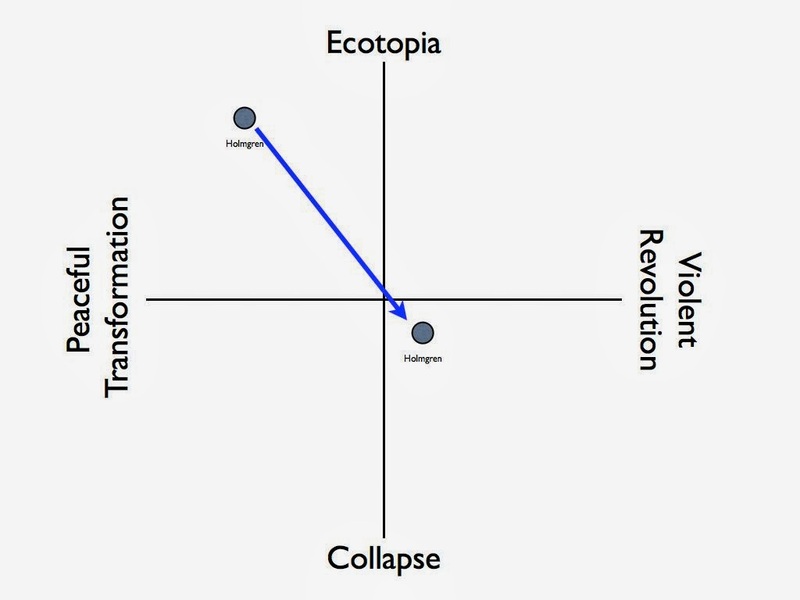 I would say the right side of the chart should be "Active Resistance" not "Violent Revolution". In the lower right quadrant, that active resistance is holding actions, done to lessen but not with any hope of preventing collapse. With that clarification, I'd put James Hansen, Nicole Foss and Naomi Klein in the lower right, and shift Lovelock in the lower left. Those above the line are not Collapsniks but what I have called Salvationists. I'd sometimes put myself close to the lower right corner (when I'm angry) and sometimes in the lower left corner (when I'm more at peace with the inevitability of collapse). With time, 'gravity' will, I think, move everyone down in your chart until it only has one dimension left. I think Charles Eisenstein deserves a spot as amongst the peaceful collapsenik. I thought the world to be in an awful mess when I came to The Farm Community in 1973 feeling it was a spiritual activism to demonstrate community based on loving care for one another and I was not disappointed. 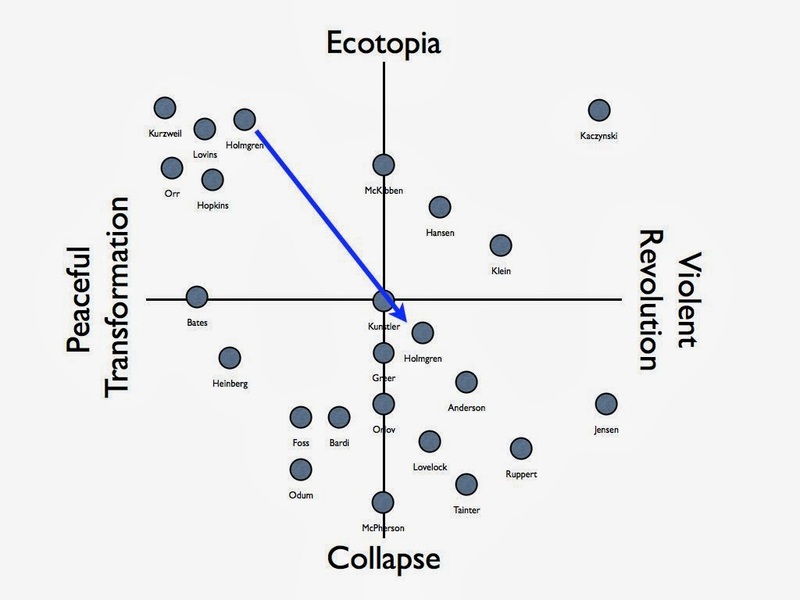 I agree Charles Eisenstein deserves a place on the graph as I think he holds that view. We had no idea how bad it would get but I still think the solution is the same. However hard it is to convince the population that they need to create local economies to shield themselves from the economic collapse the accompanying ecological collapse will likely drive us all to that out of necessity. But central to it all I think will be a new spiritual/religious fervor to reunite with nature and get back in balance with our planet, to reconnect as a species, a desire that will emerge simultaneously world around, because our bodies of a trillion intelligent cells simply won't allow it all to go down. One could call that faith, I call it a simply a choice. I am still involved with the Green Party despite understanding that the current political system will never effectively respond to our needs. I can't help but to continue to push toward a new political economy. Prosecution: Objection, your Honor. Counsel for the Defense is requesting he be allowed to tell a story—without any indication that the story is relevant to this post. A second indication that this story is relevant: the story is a creation myth, and as such it brings up the question “What are we?” I submit that our answers to the question “What are we?” are very much related to what kind of charts we make, and where we want to be on such charts. Judge: Objection overruled. Counsel may proceed with his story. What's interesting about all these approaches, is that they are all in agreement that this show can't go on in it's destructive way without creating an accelerating "collapse". If this be the case, to hasten it without giving hope to some of us latecomers would be in itself an attack/punishment for not being here sooner. I would rather proceed to an alternate way which in itself retracts my involvement with the "system". That is a silent and peaceful way which will not alienate those who are fence sitters or who just are in the dark. The house is already burning.....there's no need to light an additional match to it. What if I am a non-violent pessimistic collapsenik? That's what I am, but it doesn't fit on this chart? I am too, Alex. Thats why I created my chart. You may be what I call an 'existentialist'. I think Graeme Sait should be added to the map. He's the greatest speaker I've heard on getting carbon and life back into the soil. Graeme is working hard and trying to ignore the potential hopelessness of it all, in case we still have time. You may wish to include the MILINT Earth Day crowd; if you wish. I would say that, in all likelihood, some confluence of many, if not most, of these views and predictions is going to take place. It is difficult to make accurate predictions during a time like this, when technological development is tremendous and accelerating, while, at the same time, environmental disasters are becoming more and more frequent and severe, and the pace at which they occur is accelerating with the overall direction of climate change and ecological destruction; resource depletion threatens to overwhelm global food and water security (and thus energy, infrastructure, and resultant technological growth); and over-consumption, overpopulation, and economic inequality only serve to make matters worse.